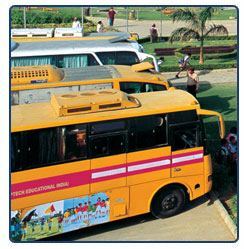 The school operates its AC buses on specific routes covering almost whole of Gurgaon. Route planning is done considering factors like availability of transport requests by the parents, availability of seats, common bus stops, motorable roads etc. 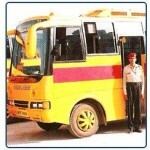 While the buses are run at the request of the parents’ security of the students is the prime concern. Every bus is having a trained and eligible driver, a conductor, a transport coordinator on school rolls, a nanny during the initial drop and a teacher on duty. All our drivers are well experienced, periodically trained on school bus safety rules and regulations. Transport coordinators are the bonafide employees of the school, duly trained on basic first aid and firefighting skills to ensure proper handling during an emergency. A first aid kit duly checked and monitored by the school medical advisor for the validity of medicines is always there in every bus, under the control of the transport coordinator. All buses are manufactured as per safety norms and undergo stringent maintenance checks. Every bus is equipped with the mobile phone for quick connectivity with the parents. GPS and CCTV are other features of the buses. Grooming check of the drivers/conductors, maintenance snag records, monthly inspection of buses and routine maintenance are few procedures followed to ensure smooth operations. ROUTE 08 Valley View, Sector – 55, Karam-Hi-Dharm Apts, Chandra Group Appt, The Vastu C.G.H.S, City C.G.H.S Appt, Technical Paradise, Hewo-I, Lion CGHS, Sector-56, Devender Vihar, Technocrate Appt, Vighan Vihar, Huda C.G.H.S, Arihant Appt, Gulmohar Appts. ROUTE 09 Sector-40 Market, Raheja Apts, Sector-31, Jal Vayu Vihar, Uniworld City, The World Spa, Sector-40 Main road, Southcity -1 Gate, The Palms, Aviation Heights. ROUTE 10 Park View City, Tatwam Villas, Aaron Ville, Parsavnath Greenville, Uppal South End, Eledeco Mansions, Palm Drive. ROUTE 11 Sector – 14, Sector 17A, Sector – 14, Mothers Pride, Essel Tower, Ivy Appt, Block-B Sushant Lok, Gold Souk, Sushant Estate. ROUTE 14 Pioneer Park, Ireo Skyon, Heritage One, Time Residency, Espace Nirvana, Deerwood, Espen Green, Close North, Close South. ROUTE 16 Sector-37, Sector 10, Sector 9, Civil Lines, Airport Appts., Malibu Town, Bestech Park View, M2k White House, Orchid Island, Citizen Appt., New Shivalik Appt. ROUTE 18 Sec – 71 CHD Avenue, Spaze Privy, Vipul World, Palladians, Today Blossoms, Mayfield Gardens, Hibiscus, BPTP Parklife Appt. ROUTE 22 Sector 15 Part-I, Hope Appt, Rail Vihar, Hewo Apt Sec 15, Sector15 Part-II, Police Station, Hewo Apt Sec-31, Mohyal Colony. ROUTE 23 Park Place, Alaknanda, Rail Vihar, Jal Vayu Towers. ROUTE 24 Sector 70 Paras Irene, Eden Height, Tulip Orange, Tulip Violet, Tulip Ivory, Tulip White, Sector 72 Tata Primanti, Park Veiwcity II, Vatika City. ROUTE 25 Oakwood DLF-II, The Villas, L-Block DLF-II, Heritage City, Beverly Park-I, Essel Tower. ROUTE 26 Monsoon Breeze, Mapsko Casabella, Vatika India Next, DLF Primus Sector 82A, Sector-37D, DLF New Town Heights Sector 86. 1. Routes of the school buses are drawn up carefully after due consideration. However, the decision of the school authorities will be final of issues related to routing, pick up point etc. 2. Students are not allowed to change their buses under any circumstances. 3. As a rule, the routes will be planned in order to provide maximum convenience, however, routes cannot be always customized as per requirement.